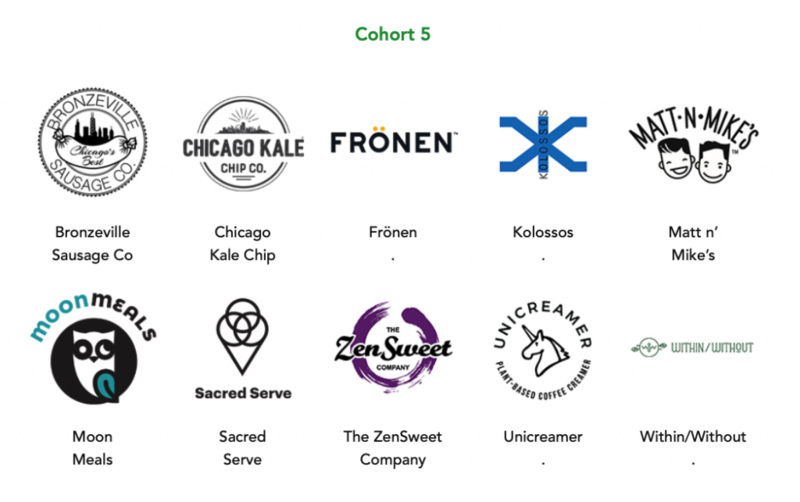 The Good Food Accelerator (GFA) gets emerging Good Food CPG (consumer packaged goods) brands ready for prime time, giving them the skills to scale up. Now in its fifth year, this fellowship program for food entrepreneurs is based at 1871, Chicago’s center of innovation. Fellows are paired with industry-leading mentors and are connected to potential customers and investors. This is the nation’s first accelerator focused on building supply chains for sustainable local food. The GFA helps food entrepreneurs expand the production, marketing, and distribution of locally and responsibly produced food, in order to enhance the social, economic and environmental health of our communities. We provide competitively selected fellows with coaching, mentoring, strategic support, and access to resources and capital so they can thrive commercially and have a powerful ripple effect on the local economy, and beyond. So today I am at Chicago’s technology & entrepreneurship center, 1871, to talk the Good Food Accelerator Cohort 5 Fellows about how to use marketing when talking to retail food buyers. I’ve built a marketing workshop around common NewPoint themes grounded in developing into a category expert. Each fellow was assigned homework, and we’ll be discussing creating a killer retail buyer pitch deck. I’ve asked each to study the category POG (plan-o-gram) at an aspirational retailer as well as list and document branding, packaging, and typical social media for brands they consider the category leader or top competitor. I’ve gotten to know several of the fellows over the past year. Each is impressive in their category and unique value proposition. Eugene Shelby, Bronzeville Sausage: Bronzeville Sausage produces all-natural smoked chicken sausage for a healthy alternative to beef and pork. All products are non-GMO, gluten-free, Halal, and Amish certified. Jessica Gartenstein & Erik Nadeau, Frönen: Frönen produces a line of delicious, non-dairy ice creams made with five simple ingredients or fewer. All flavors are low in sugar and fat, allergen-friendly, paleo, and vegan with a low-glycemic index making it the perfect guilt-free indulgence. Giorgios Karayannis, Kolossos: Kolossos produces premium 100% Greek extra virgin olive oils & organic wine vinegar with beautiful characteristics that can be utilized as culinary ingredients, and contain a wealth of health properties. LaForce Baker, Moon Meals: Moon Meals provides tasty, plant-based grab and go meals for the modern consumer utilizing a combination of proprietary vegan meats, cheeses, and sauces. Their first product, the Fiesta Wrap, is a healthy vegan burrito full of flavor and healthful plant-based ingredients. Kailey Donewald, Sacred Serve: Sacred Serve’s vegan gelato combines raw, certified organic coconuts with low glycemic coconut sugar and superfoods to create a nutrient dense, rich and creamy gelato. Sacred serve comes in several unique flavors that are low in sugar, paleo, and strictly free of all gluten, dairy, soy, GMOs, stabilizers, and preservatives. Michelle Francis-Winer and Corey Winer, Zen Sweet: The ZenSweet Company produces an all natural Monkfruit Sweetener and better-for-you baking mixes that combine their original Monkfruit Sweetener with clean ingredients. Their Monkfruit Sweetener is a non-GMO, zero glycemic, zero-calories, Vegan, Keto, and Paleo-friendly sugar replacement that measures cup for cup to sugar, and the baking mixes are all grain and gluten free, low carb, paleo, and packed with flavor! Lori and Elise Lefcourt, Unicreamer: Unicreamer is a vegan portable coffee creamer that is a clean label and contains 3g of plant protein and 3g MCT oil per serving making it a supercharged alternative to standard coffee creamer with the power to keep you full + focused. Their proprietary formulations are made to dissolve into liquids and make coffee creamy, delicious, and better for you. Brittany Chibe, Within/Without: Within/Without creates better for you snacks that nourish from within. Their granola caters to the consumer with dietary restrictions and is free-from grains, gluten, dairy, soy, and refined sugars. Made with eight all-natural ingredients or less, Within Without granola is filled with healthy fats and protein and low in carbohydrates and sugar with a chewy texture and unique flavors that will have you coming back for more.